One of the greatest joys the Scripture Lady has is introducing God’s Word, the Bible, to preschoolers. She loves to come up with creative ways to share Bible verses and their truths to these little ones. Preschoolers are like little sponges ready to soak up everything you tell them. So why not fill their minds with God’s truth right at the beginning? Teaching preschoolers takes a great deal of work and preparation to keep their attention. A good and kind heart is needed too. However, if your teachers are not well equipped to teach this age, a kind heart can turn frustrated fairly quickly. Are their really “tricks of the trade” when it comes to teaching preschoolers? Absolutely! And after over 2 decades of performing in front of hundreds and hundreds of young children, Kathy knows what it takes to keep a classroom of preschoolers engaged. The Scripture Lady’s preschool teacher training workshops can truly help your preschool teachers become more effective in their God-given calling. 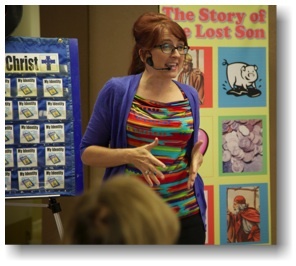 So what can a Scripture Lady Preschool Teacher Training Workshop do for you? It will energize your teachers with creativity and enlarge their hearts for young children. It will teach practical ways to engage your kids with the Word of God and make it understandable for their age. One of the biggest struggles teachers of any kind have is maintaining order and discipline in their classrooms. Your little ones are wired to wiggle! Are there really “tricks of the trade” that can be implemented so that class time can be fun and fulfilling for all involved? You bet there are! And this workshop is designed to give you some practical steps you can take to have a dynamic and disciplined classroom with your precious preschoolers. Not everyone likes to sing, but everyone loves music – especially preschoolers. They love the beat, the lilt, the movement and the rhyme. For a Children’s Ministry, music should be one of the first go-to tools for teaching the Word of God. This workshop is perfect for any Christian classroom who wants to add some zip-a-dee-do-da to their music time. Kathy has been getting kids and their teachers excited about Jesus through melody for over 20 years and would love to give you some new and creative ideas for sharing music with your little ones that will aide in Bible memory and Bible literacy. A common question we receive is “Do you have any games for preschoolers?” Our answer: “Yes, we do!” Bible games for preschoolers are one of our specialties and this workshop will pass along fun games for memory verse time, Bible story time and worship time with your little ones. Do you have your “Who Does God Love Heart”? Or how about your “Roll It Prayer Box”? How about your inflatable monkeys? “No,” you say? Well then it’s time to learn about these fun and engaging resources perfect for teaching your little ones all about God and His love for them. This workshop is designed to encourage “out of the box” thinking and stretch your imagination as we present many different and creative ways to share God’s amazing Word. Workshop #5: It’s Bible Story Time for Your Preschoolers! When should Bible literacy begin? De we have to wait for our kids to become readers or even older before they are expected to be familiar with the most common Bible stories? We don’t think so. Becoming acquainted with the stories of the Bible can and should begin in preschool. The 2 keys to presenting Bible stories to preschoolers are creative forms of teaching and the use of great visuals. Take this workshop to learn how to engage your little ones with God’s amazing Word. For over 20 years, Kathy Vincent, The Scripture Lady, has been creatively sharing God’s Word to countless preschoolers. Your chapel times should be the highlight of the week as you glorify God with this time-honored tradition. Step into this interactive and fun workshop to learn how to make your chapels creative and engaging for your little ones and why your chapel times should be GREAT! 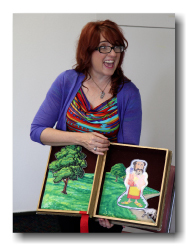 The Scripture Lady LOVES Bible object lessons! She know that props and objects are great visuals for helping your little ones stay engaged with God’s amazing Word. This workshop will present 10 very creative object lessons designed to teach the truths of the Bible with a little “magic” thrown in for good measure.